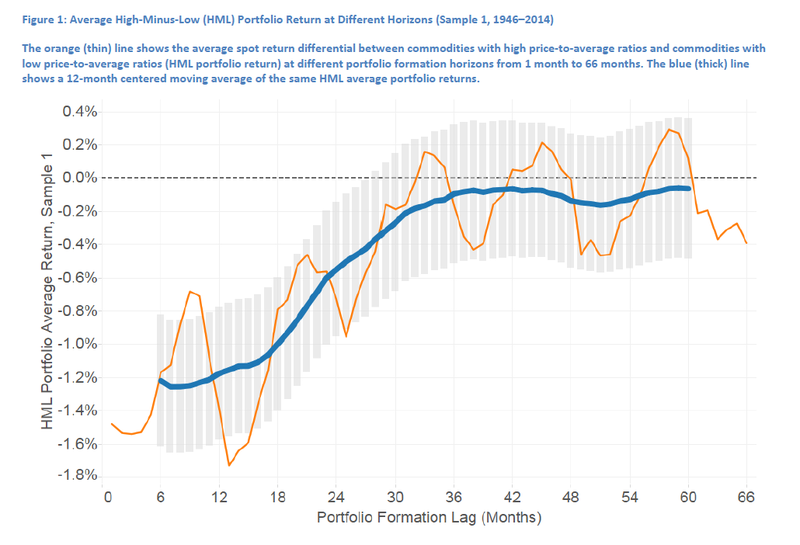 We often only think in terms of market risk and return where risk is measured by the standard deviation of returns. It is easy to calculate and update. Unfortunately, the changing nature of markets makes for messy calculations and analysis. Assuming a normal distribution is just too simple for measuring risk. Investors have to be aware of skew in return distributions. More specifically, investors have to account for negative skew because the unexpected extra downside risk is what really hurts portfolio returns. Skew can be explained or models through a mixed distribution approach. Simply put, if you have normal price dynamics mixed with a jump process for some negative shock, you will get negative skew in the mix. You can think of jumps as regime shifts that have some low probability of occurring. All an investor has to do is look at the shock behavior of markets from financial crises or recessions to see that a mixed distribution is relevant. Jumps can be predicted to occur but that does not mean we know when they will occur. Interestingly, the impact of jumps and thus negative skew become more relevant when normal volatility is low. High volatility will mask the jump impact, so skew risk is greater when markets seem calm. The impact of skew can be incorporated in a risk parity portfolio approach with meaningful results. If a Gaussian mixed distribution is used to proxy for skew, risks can be balanced beyond just volatility. 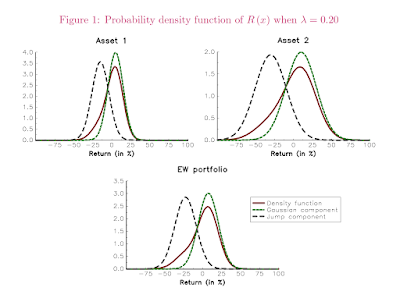 If there is more skew within the assets to be allocated, there will be larger adjustments in portfolio allocations relative to the conventional approach of risk parity or just mean/variance optimization. New research by some leading advocates of risk parity show that accounting for skew is relevant. The adjustments in allocations are meaningful and can help offset the risks from jumps in return behavior. 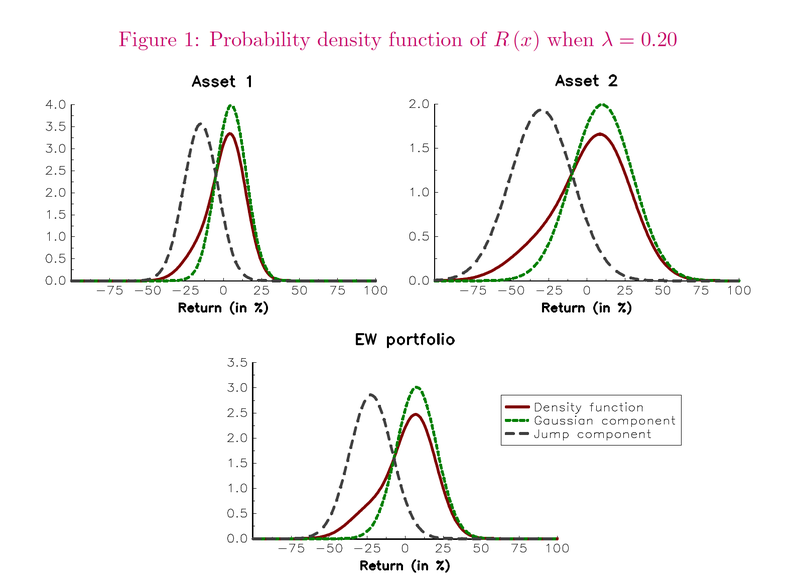 See “Risk Parity Portfolios with Skewness Risk: An Application to Factor Investing and alternative Risk Premia”. Volatility management in a risk parity framework will create more turn-over and will only capture events after the fact. Accounting for skew can reduce turnover and account for jumps before they occur. For example, if there is a negative jump or shock, volatility will rise after the event causing a decline in allocation to this risky asset. 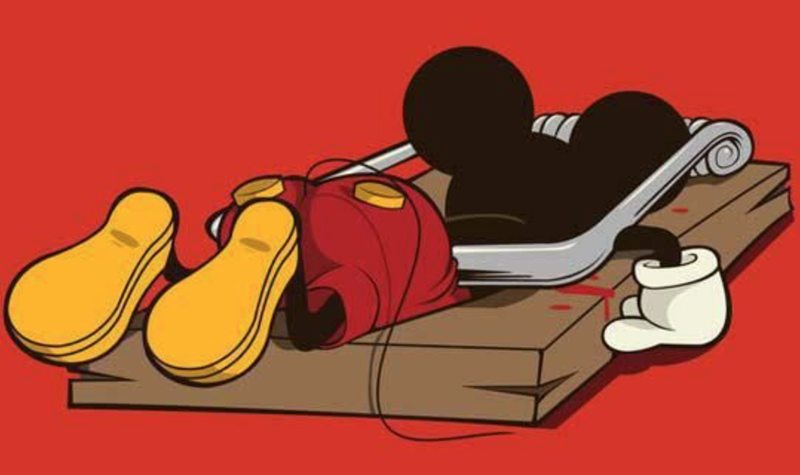 Unfortunately, this is too late. Accounting for skew from the chance of jumps would have forced a lower allocation to the risky asset and better addressed the potential for a negative shock. Since not all strategies or asset class behavior have the same skewness or response to jumps, there has to be a careful analysis of strategies, risk premiums, and price behavior. 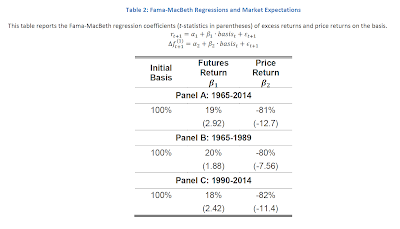 Some risk factors are more subject to jumps, so accounting for skew is more important. Skew should be measured, but more importantly, it can be managed separately from volatility. Momentum in futures not spot - Hidden in the basis? 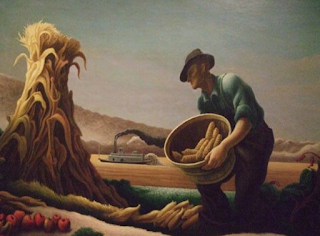 Momentum strategies work with commodity futures, but a closer examination shows that the same momentum strategies are not effective with commodity spot prices. This result, that the cash price action is not mirrored in the futures prices, seems odd. Of course, the futures are expectational markets, but the cross-sectional behavior in spot should be represented to a similar degree in futures. Alternatively, spot commodity prices shows strong mean-reverting effects while commodity futures do to show this same behavior. 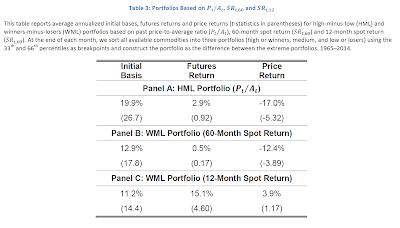 These are the conclusions of research in the new paper, Momentum and Mean-reversion in Commodity Spot and Futures Markets, by Chaves and Viswanathan. This research suggests that the momentum effect must be embedded in the basis or how the futures markets move relative to cash. A number of researchers have found momentum effects in commodity markets so it would seem like a natural question to determine whether it is driven by behavior in the spot prices. The researchers find it is not, but they do find that spot prices are mean-reverting which does seems consistent with the old adage, "the solution to low prices is low prices." The only difference between the cash and futures prices is with the basis, which measures the link between the cash and futures, so this seems to be the natural place to look for why these differences between spot and futures exist. 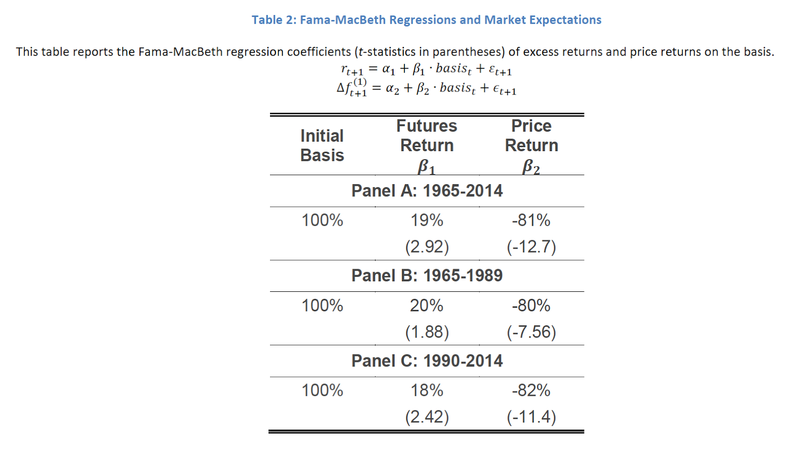 The researchers replicate earlier work by Fama-French to show that there is a risk premium in futures which could be an explanation for these results. Using cross-sectional analysis, the researchers find that mean-reverting strategies do not work in futures because the futures seem to reflect the reversal in price. However, there are opportunities for momentum in futures price when there is a large positive basis. The authors offer some explanations for these interesting results, but I regard their work as preliminary. If anything, their work suggests a puzzle in the price dynamics of futures over spot. My view is that futures reflect the dynamics of storage and convenience yield in ways that are clearly not reflected in spot prices, but this will require more analysis to find the underlying relationships. The clearinghouse is the truly special feature of any futures exchange because it allows buyers and sellers to comfortably come together to trade with only limited credit risk. Traders know that they do not have to worry about the specific risk of their trade counter-party because their risk is with the clearinghouse. 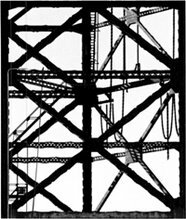 We know that the actual structures in place are more complex than this simple story. The mechanics make all the difference so changes should be looked at closely. There are member of the exchange who trade, but their special value has been diminished with closing of the floor. There are also futures commission merchants (FCM's) that are the members of the clearinghouse. In the case of a failure, the first defense is the FCM and the firms associated with that FCM. The risk of the client/user is with the capital of the FCM and the other clients of the FCM. The poor credit of the FCM’s clients place more risk on the FCM first and then the clearinghouse. The defenses of the FCM have to be eroded before the clearinghouse funds and those funds of the other clearinghouse members will be employed. These layers of protection make for a better system. What is key for the whole system is that any trader does not have to directly worry about the credit on the other side of any trade. The credit risk is worked through the margin system and the linking of FCM’s with clients and then other FCM’s and the clearinghouse. Actually, it is a little more complex. The new direct members of the clearinghouse will be called Direct Funding Participants (DFP's), but they will still need a guarantee from an FCM called the DFP guarantor who will indemnify the clearinghouse against loss. The FCM who is a guarantor gets relieve from the full regulatory leverage capital requirements. The DFP posts more margin, approximately an extra 4+% and the DFP posts 4+% so the capital put up for the trades will be the same as if the user was still doing business with the FCM. The capital for using the exchange clearinghouse is the same but the cost is split differently. 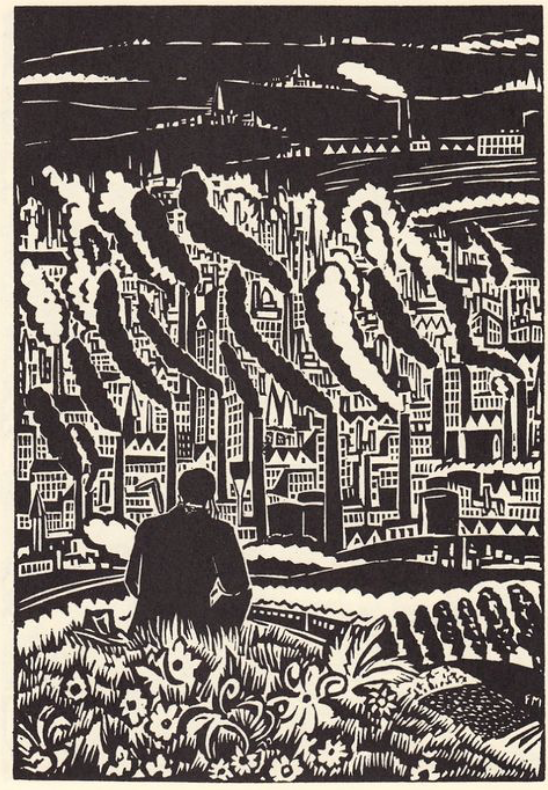 What are the gains for the system? Settlements will be streamlined and less concentrated, which will be good in a crisis. Large clients will reduce their credit risk at a cost of higher margin, albeit these firms, likely money managers, will have excess cash. FCM’s get capital requirement relieve that is making their businesses less profitable. Everyone wins. The scenario of a win for everyone seems the most likely outcome, but there should be some nervousness with changes to the plumbing of financial markets. These changes are partially responses to the Basel III regulation of banks. These are advancements, but a conservative streak tells me there are usually some unintended consequences that we have yet to explore. For most times, this will be a non-issue, but with all plumbing, if it works well, it will never be a concern until it is too late. 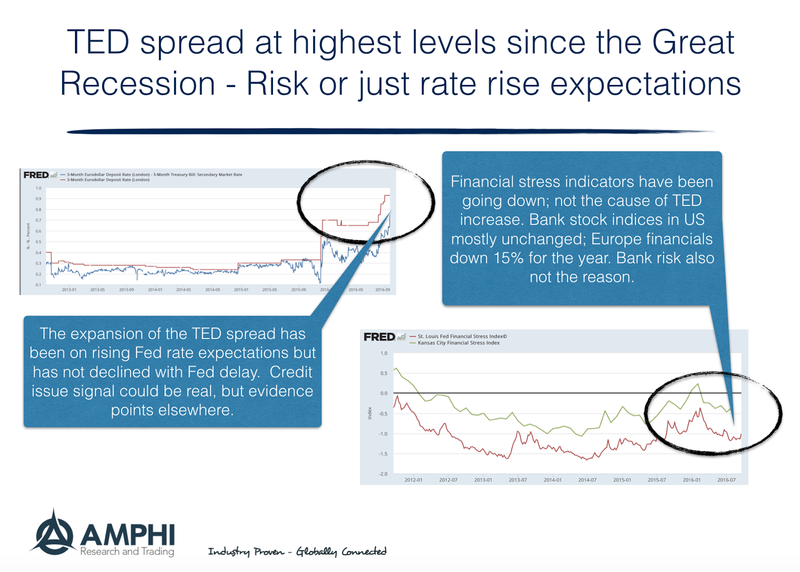 The TED spread has been used as financial market warning signal for decades although it has moved in and out of favor over time. Market participants have turned to other measure of financial risk, but when this old measure jumps, it is worth taking a closer peek. There is an interesting signal here but it may not be higher risk. The Financial stress indicators from the Kansas City and St Louis Fed have both been moving lower not higher. Bank stocks in the US have been flat for the year albeit European financials have declined 15 percent in 2016. 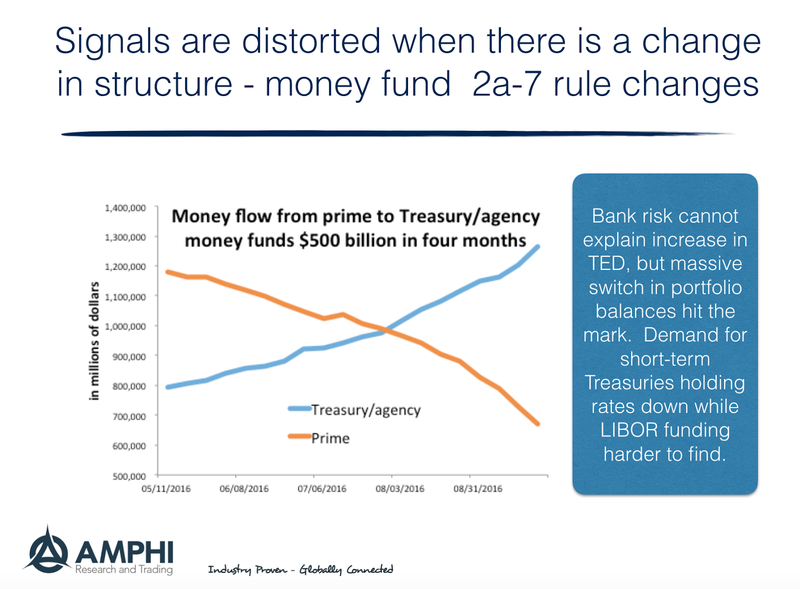 The TED spread is signaling higher funding costs from a significant change in regulation. The reforms of 2a-7 money funds is coming on October 14 and the market has been adjusting by pulling out of investments in non-Treasury short-term money sources. There has been a $500 billion money fund switch from prime funds to Treasury/agency funds. This is a large change in market share of about 15 percent. We think the money flows are the driven not risk. While we often state that prices are primal, the explanation for price moves is not always obvious. 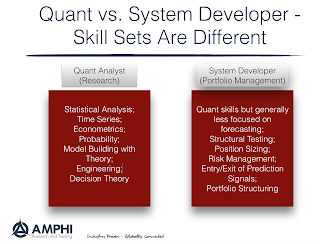 Thinking about the analysis of systematic global macro and managed futures managers, I asked a simple question, is there a difference between a quant and system developer. A portfolio system is a complete integrated approach for making market predictions and investment decisions including sizing, entry, exit, and risk management. 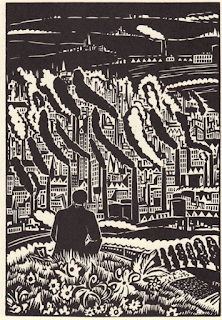 Is it possible for a manager to be less well-trained as many newly minted engineering quants, but still be talented at building portfolio systems? Many use these words quant and system developer interchangeably, but in practice, there are significant differences. Simply put, all quants are not system developers and all system developers are not quants. This distinction is important. A quant can find relationships in the data. 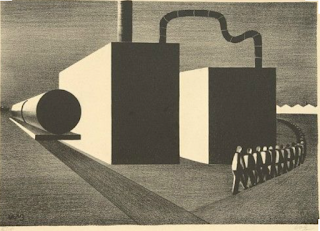 The systems developer exploits the relationships found by a quant. Of course, someone could have the characteristics of both, but we view them as separate skills. 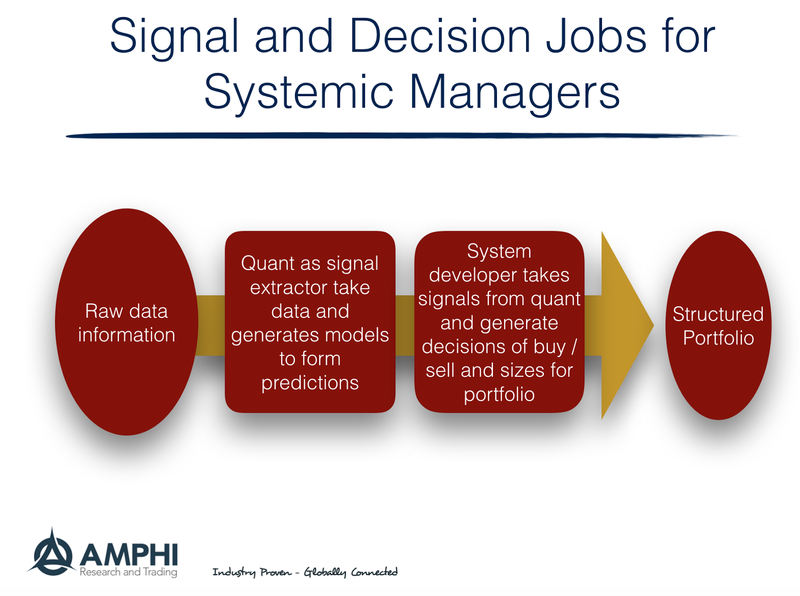 The investment into a systematic manager should focus not just on the quality of their quants, but also on the firm's ability to build systems. This is similar to the question of differences between research and portfolio management in traditional money management. Now, this can blend into the same thing, but we believe focusing on the different skills is helpful. The quant is a signal extractor. 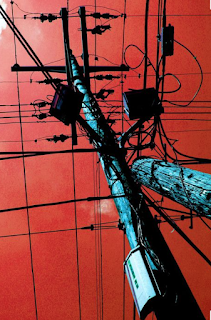 The systems developer is a signal adaptor. 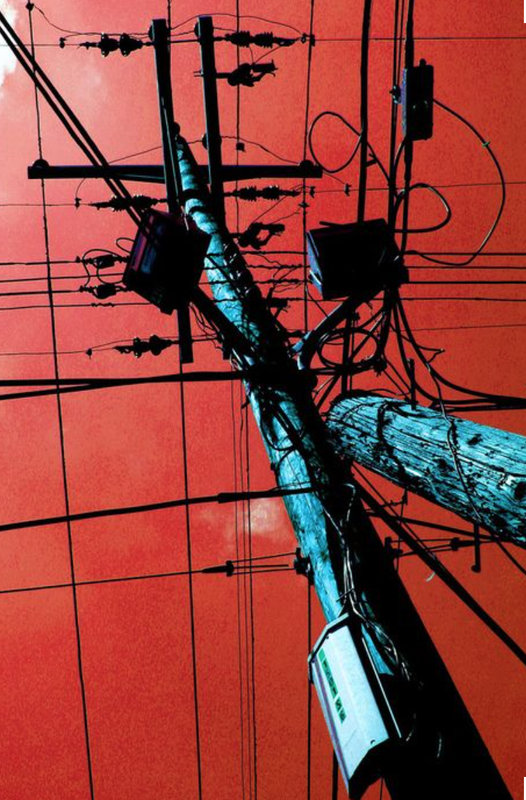 The extraction of signals can be relatively simple through looking at trends or momentum or it can be complex through the measurement of multiple risk premia. The real work may come through analysis of the system developer who has to take the signals form the models and balance them in a portfolio. We know that predictions in financial markets have low explanatory power, so sizing position, setting entry points, and determining when to exit through either changes in signals or stop levels is critical. The set of signals across all asset classes have to be blended into a portfolio. 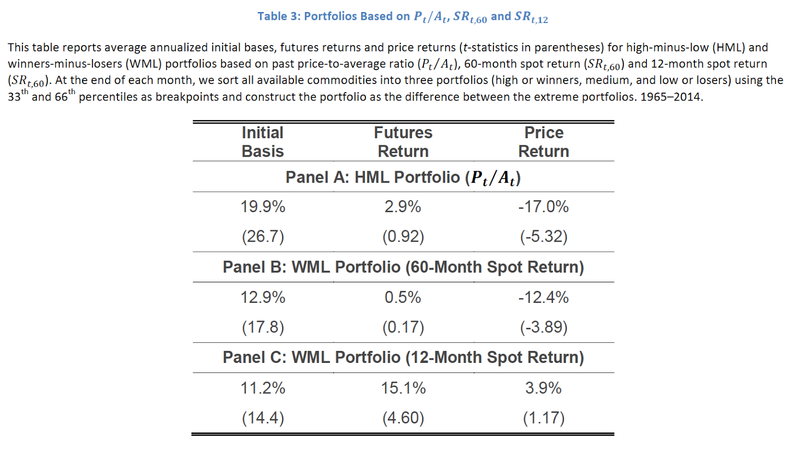 Some will call this the art of portfolio management but it not something that is usually discussed in quant training. The quant is perhaps more akin to the research in a traditional money management firm while the system developer is closer to the activities of the portfolio manager. 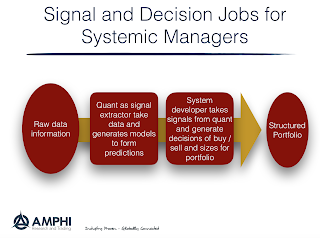 By separating the functions of quant and system developer or research and portfolio management, the activities conducted by the systematic manager are given more clarity. The advice of Mr Jaggers, "Follow the evidence."